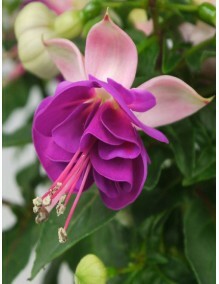 Fuchsia Jollies have become a trademark for a very special fuchsia selection. They are robust, perfectly branched and more disease resistant than traditional varieties making them extremely easy to grow with success. Fuchsia Valence produces pale purple and white flowers throughout the summer. Fuchsia Jollies Valence is a trailing fuchsia suitable for baskets or tubs.